Every now and then the kids get the opportunity to do something that seems straight out of an 80s American sitcom to me. Something I never got to experience during my own childhood in Australia but saw on countless American TV shows as I grew up. Carving pumpkins, trick or treating, handing out Valentine's to the class, long Summer vacations, cheer leading, selling homemade lemonade for a quarter... All of these things were completely foreign to me as a child but have become favorite experiences for my own kids. Recently we got to cross another American childhood institution off the list: Take Your Child to Work Day. Two weeks back it was Take Your Child to Work Day at YouTube where Kim works. The kids were so excited about going to work with Daddy. Ok, so was I! Not only was I keen to see Kim's workplace, but I was kind of excited to be able to live vicariously through my kids and take part in something I'd seen on TV so many times as a kid. Admittedly, as a kid I did actually go to work my parents on many occasions. Our family owned a transport business and I spent many hours riding in a truck with my Dad, my little brother and my cousins. But on TV Take Your Child to Work Day almost always took place in a large city office building so to me riding in a truck just wasn't the same. It never involved a day off school either! The other reason to be excited about Take Your Child to Work Day? We knew that there was a fun day full of exciting activities in store for us! As far as we can tell from Take Your Child to Work Day, Kim spends his time at work playing with Lego, making baking soda volcanoes, watching movies, eating yummy food, and making crafts. Sounds like kid heaven, right? Ok, the eating yummy food part might be right but the rest was just for us. Before we got into all that fun stuff I figured we needed to do a few things that were more like Kim's regular work day. We started off by catching BART to work. Seeing as it was morning peak hour, the train was pretty busy the whole way into the city from Berkeley and we didn't get to sit together. Once we left the city and headed towards Kim's office in San Bruno the train emptied out a lot. 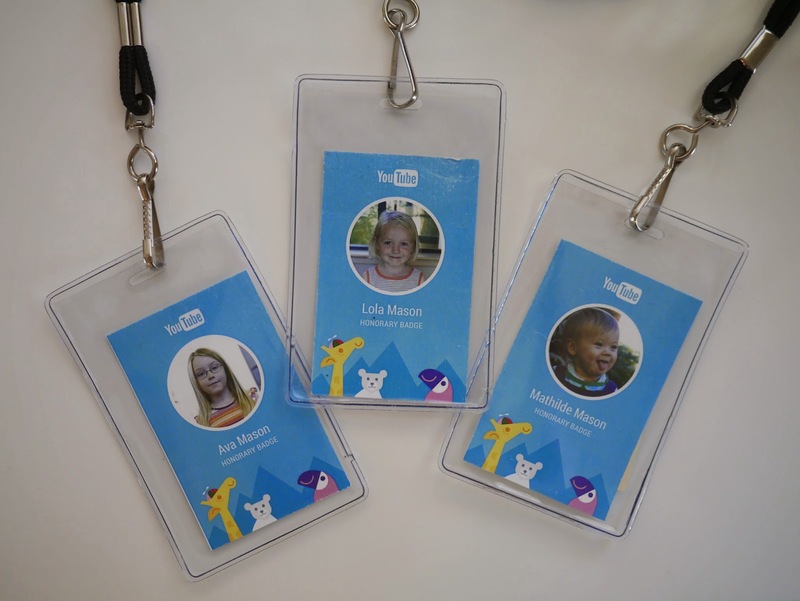 When we arrived at You Tube we picked up the honorary badges that had been created for the kids and made our way to Kim's desk to drop off our stuff - and to pretend to do a little computing! The girls thought it was pretty amazing that Kim's desk moves up and down going from a regular desk to a standing desk. Lola thought it was even more amazing when we found a treadmill desk nearby! We then headed downstairs to all the fun. The girls made crowns with LED lights, watched baking soda volcano experiments, took part in Lego workshops and of course, watched shows on You Tube Kids. Outside the girls tried their hand at basketball and posed for funny photos in front of a mural. Later in the day Ava and Lola made snack bowls full of popcorn, fruit and candy and settled in to watch a movie. After the movie it was time for Friday afternoon happy hour. We grabbed more delicious food from the cafeteria and headed outside to eat. The girls and I then went for a walk around the eucalyptus grove on site. The girls climbed trees, played with sticks and played a game of horse shoe. Or in Lola's case, cheated at horse shoe! Take Your Child to Work Day fell on Mathilde's first birthday this year. In fact, last year Kim had been ready to take Ava and Lola to work for the event but Mathilde decided to come a few days early and was born the day before. We all had such a fun day and can't wait for more Take Your Child to Work Days in the future.